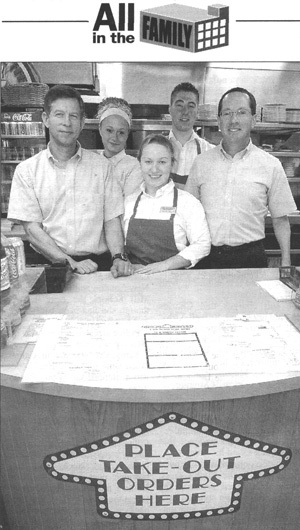 The Rein's Deli "family" includes, from left to right, Greg Rein, Stefanie Windecker, Melissa Basch, Andrew Rein, and Steve Kassman. VERNON — Sometimes, the "family" in a family business means more than just people with the same last name. That's the case at Rein's Deli, a local institution since its inception in 1972. The New York-style deli was founded by Bob Rein and his wife, Betty, who were soon joined by Bob's brother, Bernie. The Reins came up to Connecticut from New Jersey for another business, but pretty soon, as the legend goes, Bob Rein found himself unable to locate a decent corned-beef sandwich. Four of Bob and Betty's children have worked at the restaurant over the years, including their daughter, Bonnie Rein Shebat, and their son, Greg, who currently preside over the deli. But as Greg Rein, who has been in the restaurant for a little over a decade says, the family mindset extends beyond the Reins. "You look at your employees differently and treat your employees in a different way," he says. "It's not corporate. As a family, you think like a family." A sterling example of this is Steve Kassman, general manager of the restaurant, who started out as a line cook 28 years ago, when he was in college. "The employees are really part of the extended family," he says. "There's a level of hospitality and trust here that comes with the business, I think. It's a people business; it's about making people happy." The family atmosphere has helped the business weather a number of tragedies, ranging from the death of Bob Rein to the 1990 fire in the El Camino Plaza that led to the deli moving to its present location on Route 30. Through it all, business has continued to boom as customers crowd the restaurant for breakfast, lunch, and dinner, for a sample of some of Rein's signature deli dishes. "My father created a deli in the image of what we knew, what we grew up with," Greg Rein says. "The recipes haven't changed in 32 years." Of course, sometimes, working with people who are so close can present unique challenges. "You have to have a little more compassion and sensitivity," Kassman says. "But you get it back in return." One issue that all family businesses confront is the question of succession: how a business passes from one generation to another. This isn't a problem in, say, a joint-stock corporation owned by shareholders, but Greg Rein says his family is keenly aware of how it affects a business like theirs. "Businesses have been lost because succession planning was not done, or not done properly," he says, adding that his family has taken steps to insure that doesn't happen to Rein's. That, of course, would be unthinkable to the deli's legion of loyal customers. "I don't know if it would be the same if it were a family jewelry store or a family insurance agency," Greg Rein says. "But food brings people together. People come in and they're glad to see you."